Matzumi is a German artist who mixes her vocals to synth layers. It’s a mixture that can annoy some because in EM voices are supposed to be in opposition with sounds. Nevertheless, the fluidity of Matzumi’s voice is merging very well to her music which is a kind of with an orchestral approach that we can compare as well to Vangelis’ and Bernd Kistenmacher’s but with an intimist, emotional and especially delicately feminine touch. Ad Infinitum is her2nd E.P. in2010, after a first album in 2009. It is a rather surprising E.P. where obscure emotions fight against words and where the ethereal approach goes alongside a minimalist sequenced phase. The Lonely Path - Prologue begins like a Berber ode. A Tuareg chant à la Enigma beneath low reverberations, nice iridescent pads of a discreet synth and ringing. Powerful, the voice of Matzumi is melting in this eclectic sound adornment of which dense mellotron layers wrap with their orchestrated fragrances. This bewitching Arabic haze continues on the intro of The Sense of Life where soft celestial layers bring us to fine sequences which drum in a minimalist echo. Twisted waves derive there. Espousing the arc of their resonances, they get muddling to ore limpid breezes and delicate ringing whereas the cadence of pulsations / percussions / sequences hasten the pace but shape however a slow minimalism rhythm. Suave vocalizes are floating as a smell of ether and wrap these beatings which pulse with insistence while synth pads smother gradually this hypnotic rhythm which goes out in of beautiful and poignant orchestral layers. We are One bathes in a dense synthesized orchestration with layers which float and waltz as leaves falling from trees and get trapped in the wind, before ending on a less intense moment that Matzumi voice flavours the movement of an exalting sensualism. It’s in a sound universe always so tinted by influences of Arabic and exotic world that we move within Ad Infinitum. Dreamtraveller is a heavy and striking track with heavy percussions which fall and collide languishingly on a rhythm as much ambiguous as its percussions. A little as in the same mould as The Sense of Life but less minimalism in its sequences hopping, Dreamtraveller is soaked with vocalises that are leaking away in this sometimes warm and sometimes metallic rhythm until he is engulfed in of dense orchestrations. Epilogue begins with oscillatory pulsations, wrapped with synth layers to iridescent mists and by Matzumi’s vocal effects. A movement between two rhythms, Epilogue embraces a soft tangent of Arabic deserts before taking back its rhythmic crusade on its pulsations and silvered synth layers which garnished the whimsical rhythm of its introduction. Oscillating between the soft vapours of a tender EM and the oniric universe of the Arabic world, Ad Infinitum is a pleasant surprise. It’s certainly isn’t the kind of opus that will smash eardrums but it is an album made all in softness and subtlety where nuances go up to the roots of sequences. I quite enjoyed this fusion voice / synth which floats as a perfume of tranquillity on always ambivalent but strongly present rhythms. 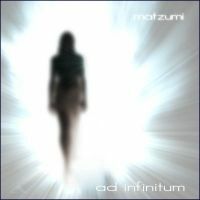 In brief, those who like the symphonic universe of Vangelis and Kistenmacher and Enigma’s suave vocalises will be delighted by this discovery whom is Matzumi.